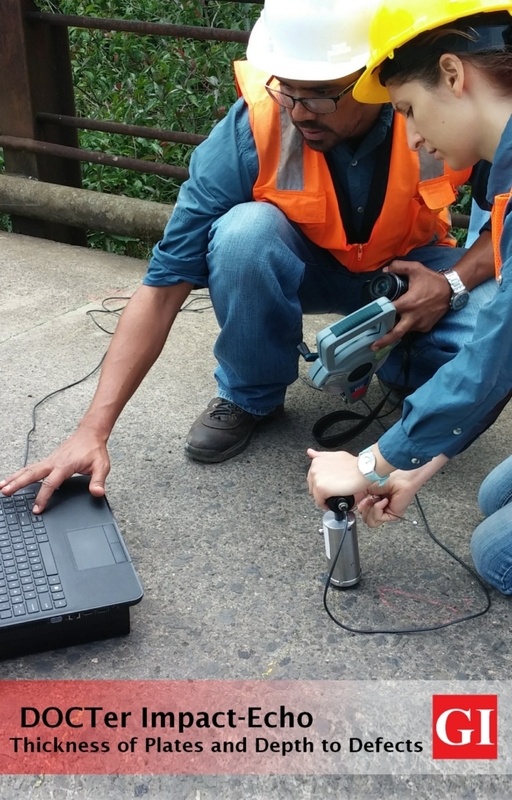 The use of traditional stress wave methods, such as ultrasonic through transmission, to identify the presence of anomalies in structures requires access to both faces of a member. Furthermore, it is not possible to determine the depth to anomalies. These drawbacks are eliminated by using the impact-echo method, which requires access to only one surface. 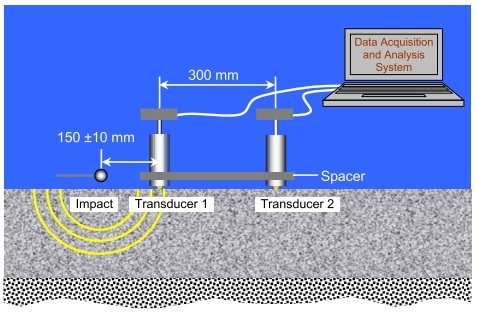 The impact-echo method is based on monitoring the periodic arrival of reflected stress waves and is able to obtain information on the depth of the internal reflecting interface or the thickness of a solid member. A short-duration stress pulse is introduced into the member by mechanical impact. This impact generated three types of stress waves that propagate away from the impact point. A surface wave (R-wave) travels along the top surface, and a P-wave and an S-wave travel into the member. 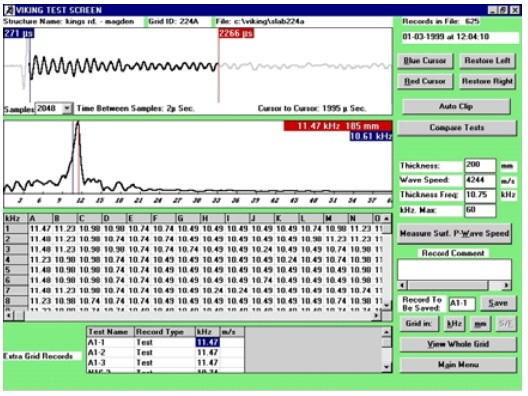 In impact-echo testing, the P-wave is used to obtain information about the member. When the P-wave reaches the back side of the member, it is reflected and travels back to the surface where the impact was generated. A sensitive displacement transducer next to the impact point picks up the disturbance due to the arrival of the P-wave. The P-wave is then reflected back into the member and the cycle begins again. Thus the P-wave undergoes multiple reflections between the two surfaces. The recorded waveform of surface displacement has a periodic pattern that is related to the thickness of the member and the wave speed. The same principle applies to reflection from an internal defect (delamination or void). Thus, the impact-echo method is able to determine the location of internal defects as well as measure the thickness of a solid member. The upper plot in this example shows the surface displacement waveform obtained from a test of a solid concrete slab. The figure below the waveform is the amplitude spectrum obtained by transforming the waveform into the frequency domain. The peak at 11.47 kHz is the thickness frequency. For a wave speed of 4240 m/s, this frequency corresponds to a thickness of 4240/(2×11,470) = 0.185 m, or 185 mm. 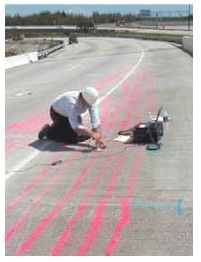 Accurate measurement of thickness requires knowledge of the in-place P-wave speed. 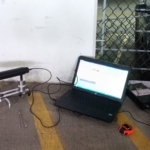 ASTM C1383, “Test Method for Measuring the P-Wave Speed and the Thickness of Concrete Plates Using the Impact-Echo Method,” permits two methods for obtaining the P-wave speed. 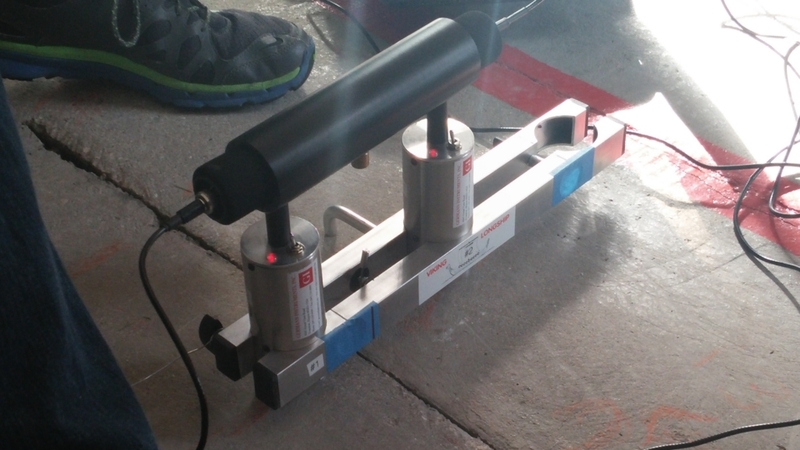 One method is by determining the thickness frequency and then measuring the actual plate thickness at that point. The equation on page 50 is used to solve for Cp, i.e., Cp = 2 f T.
Gibson, A. and Popovics, J.A., 2005, “Lamb Wave Basis for Impact-Echo Method Analysis,” J. of Engineering Mechanics (ASCE), Vol. 131, No. 4, April, pp. 438-443. The figure is an example of the measurement of P-wave speed by using two transducers a known distance apart. The time of arrival of the P-wave at each transducer is determined as the point when the signal for each transducer rises above the background value. The Viking software allows the user to place cursors at the points corresponding to the P-wave arrivals, and calculates the value of Cp. In this case, the calculated speed is 4480 m/s, and 96 % of this value is 4300 m/s. A negative reflection coefficient means that the stress changes sign when the stress wave is reflected; for example, a compressive stress would be reflected as a tensile stress. Steel is “acoustically harder” than concrete and the stress does not change sign when reflected at a concrete-steel interface. It is seen that at a concrete-air interface, there is complete reflection of the P-wave. 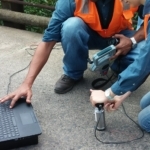 This makes the impact-echo method inherently powerful for detecting air interfaces, such as those due to delaminations, cavities, and honeycombed concrete. If the area of the reflecting interface is large, the impact-echo response will be similar to that of a solid plate except that the thickness frequency will be shifted to the higher value corresponding to the depth of the interface. If the defect is just large enough to be detectable, the amplitude spectrum will show two peaks: a high frequency peak corresponds to reflection from the interface and the low frequency peak corresponds to the portion of the P-wave that travels around the defect and reflects from the opposite surface of the plate. 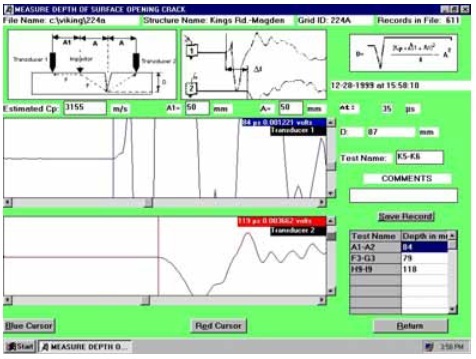 By positioning the cursor at the frequency associated with the flaw, the flaw depth is shown by the Viking software. The frequency associated with the portion of the P-wave that travels around the defect will be shifted to a lower frequency value than the solid plate thickness frequency. This is because the wave has to travel a longer distance as it diffracts around the flaw. The frequency shift is a good indicator of the presence of a flaw if it is known that the plate thickness is constant. 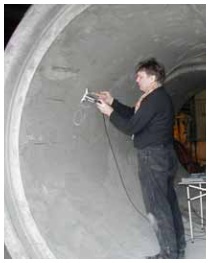 The DOCter can also be used to measure the depth of surface-opening cracks, using a time domain analysis. The LONGSHIP transducers are placed on opposite sides of the crack (as shown in the sketch to the right) and impact is generated on the line passing through the transducers. When the P-wave reaches the tip of the crack, the crack tip acts as a P-wave source, a process called diffraction. The diffracted P-wave is detected by the transducer on the opposite side of the crack from the impact. By measuring the time interval between the arrival of the direct P -wave at the first transducer and the arrival of the diffracted wave at the second transducer, the depth of the crack can be calculated. 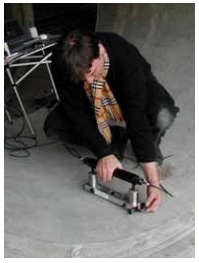 The example shown is from testing a fire-damaged structure, and a crack depth of 87 mm was estimated for a time difference of 35 μs and a P-wave speed of 3155 m/s. For P-wave speed determined by calculation from a test at a point of known thickness, the error in thickness measured by the DOCter system is estimated to be within ± 2 %. 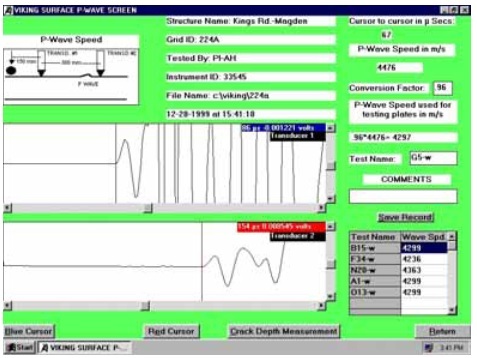 This assumes that the same P-wave speed is applicable at all test points. In the case of thickness measurement based on measuring the P-wave speed from surface measurements, the error in thickness dues to systematic errors associated with the digital nature of the measurements is about ± 3 %. This assumes that the P-wave speed is uniform with depth. The depth of surface-opening cracks can be estimated within ± 4 %. The DOCter comes in two versions: the DOC-700 for flaw detection and thickness measurement; and the DOC-4000 for flaw detection, thickness measurement, crack depth measurement, and P-wave speed measurement. The Spider multiple impactor unit can be purchased as an option to increase the operating range of the systems. 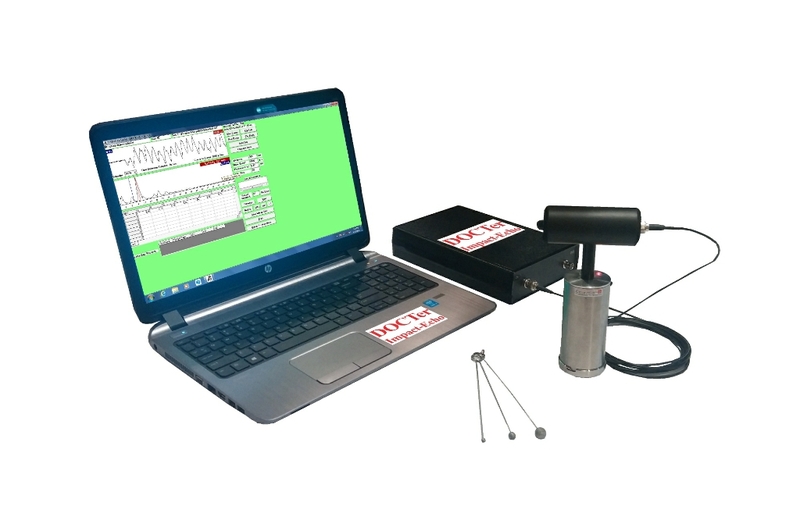 The DOC-700 system is a one-channel system for thickness measurement and flaw detection. The P-wave speed is determined by testing over a solid portion of a plate with known thickness. The system includes a laptop computer, a data acquisition module, one Mark IV transducer with impactors, and software. The hardware components and computer are delivered in attaché cases (not shown). 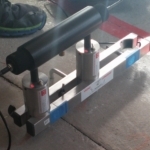 The DOC-4000 system is a two-channel system that complies with the surface method for P-wave speed measurement given in ASTM C1383. 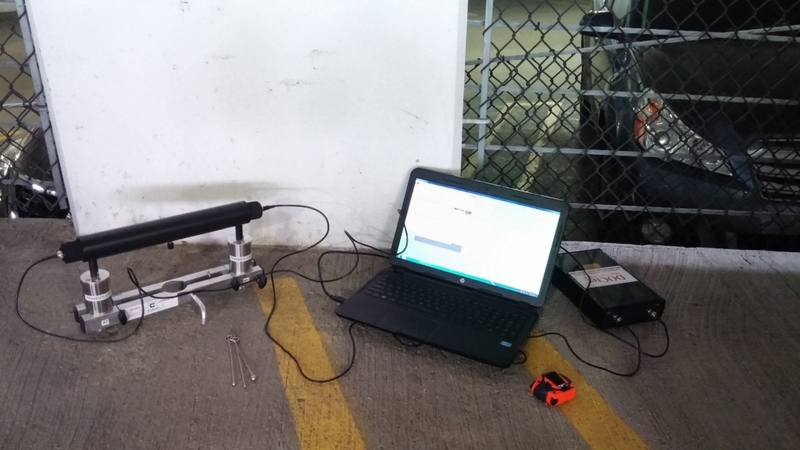 Besides thickness determination and flaw detection, the DOC-4000 can be used to estimate the depth of surface-opening cracks. 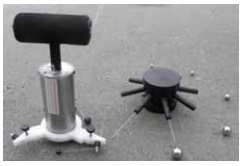 The optional Spider contains 8 spherical impactors, with diameters ranging from 2 mm to 15 mm. 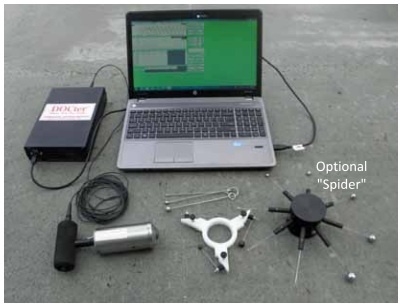 The frequency content covered by the Spider impactors is approximately 1.2 kHz to 100 kHz on a hard concrete surface. 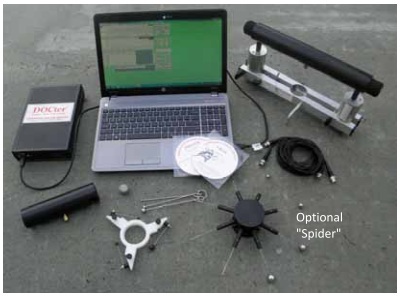 The Spider is placed adjacent to the Mark IV transducer as shown in the photo.